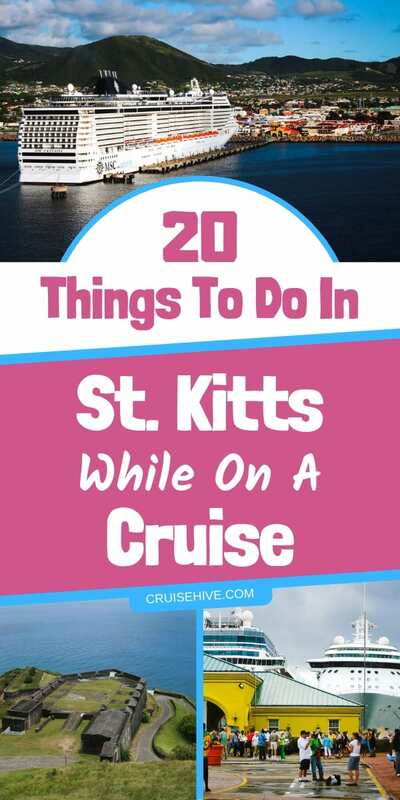 We've got all the best and most popular things to do in St. Kitts while the cruise ship is making a port of call for your Caribbean cruise vacation. Though a fairly young tourist destination in the Caribbean, St. Kitts is quickly becoming a top cruise destination. With its beautiful, picturesque landscape that is a host to plenty of unique ecosystems. St. Kitts bears all the charm and beauty of a Caribbean Gem. The island is Kissed by the Caribbean seas and blessed with lush mountain backdrops. This backdrop boasts of incredible vistas, making the island a haven of tranquility and natural beauty. Disclaimer: Clicking and purchasing from some of the links below will earn us a commission. Your ship will dock at Basseterre. From there you can walk down the pier into Port Zante. A bright yellow colored entrance marks your way into Port Zante mall where there are plenty of open-air shopping stalls. Get all your cruise accessories for your Caribbean vacation. 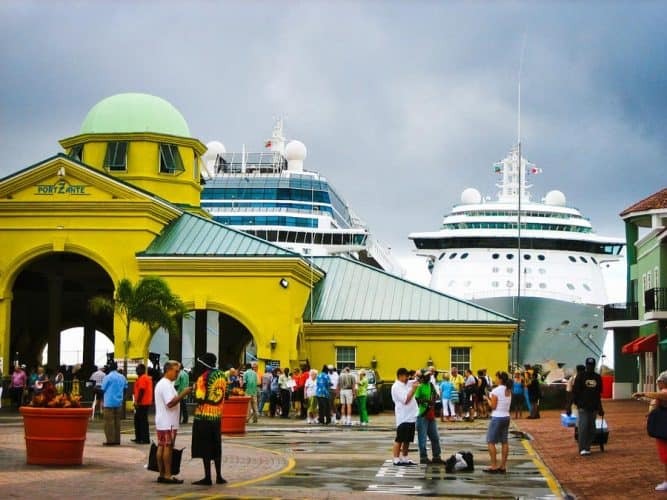 This beautiful port has plenty of cruise friendly facilities. All designed in pastel-colored buildings that host pretty eateries and glamorous retail stores. Even the country’s museum is located in the port amidst the shopping malls. A trip there will equip you with the island’s history. The archway through the museum ushers you into the downtown area for further explorations. Once downtown you can tour the historic streets of the town. Basseterre is the Capital City of St Kitts. It is a vibrant town zooming with life. Take a stroll through the historical town and discover its depth as you enjoy the scenery. It features cathedrals, a courthouse, and older buildings that have stunning architectural designs. Some interesting attractions include the “Circus” clock tower and independence square. The monument at the center of the circus resembles London’s Piccadilly circus and bears a clock tower with a water fountain. This is an ideal quick stop for a photo op. Get all your St. Kitts souvenirs online, so you have more time in port! Other places of interest include a heritage site, other monuments, breweries, craft markets, eateries, and pubs. Just a short distance from the port, you will access this highly recommended attraction in St. Kitts. 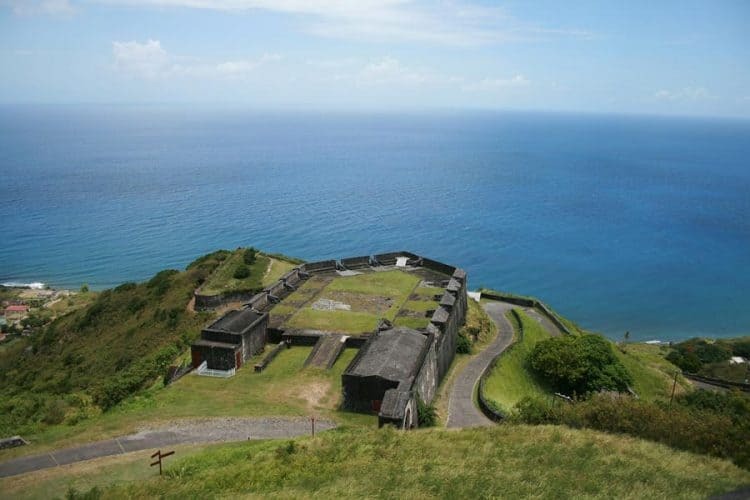 Brimstone Hill Fortress was built in the 17th century and lies a top of an 800-foot hill that overlooks the Caribbean Sea. The British design skills and the African Slaves workmanship is evident in the fortress. Dubbed as the Gibraltar of the Caribbean on the welcoming fountain at the port, it’s easy to see why. This fort is the most preserved fort in the Caribbean, still retaining its original look and hence properly bestowed a world heritage site honor by UNESCO. Enjoy the view of the calm sandy shores as seen from the park. The park remains a historical site that speaks more without uttering a word. The narrow stone gate houses act as the entrance to the Hill Fortress where you will see a visitor’s site center close to the car park. The fort features cannons pointing in all directions and vantage points with incredible vistas. St Kitts has a beautiful landscape punctuated by lush vegetation on a mountainous backdrop. One of the most popular things to do on the island is to hop on the brightly colored train for an adventure of a lifetime. The train follows the scenic old railway trail that functioned as the main transportation for sugar during the island’s sugar manufacturing days. The railway was built between 1912 and 1926 to transport sugarcane. The train has now become a top tourist attraction. The ride takes 3 hours to cover the 30-mile journey that offers the most magnificent sightseeing in St. Kitts. This unique railway trail hugs the whole northeastern coastline. Allowing a scenic view of surf, cliffs, spectacular ocean views, lush vegetations, volcanic view, and lush rainforest among others. Given its lush landscape, it’s only natural to want to explore the hidden mysteries of the jungle in St. Kitts. If you are up for a work out then exploring the rainforest of Liamuiga volcanic mountain is just the excursion for you. The rainforest’s tropical setting is rich in luxuriant diversity. Though the hike is a bit challenging it’s well worth it. The reward is a beautiful volcanic mountaintop and its accompanying vistas at the end of the hike. The great thing about this rainforest is that it has a twist, it doesn’t rain all the time, thus giving it a more approachable manner. Bug Spray is a must for the rainforest, get a good travel one from here. The treasures of its thick green trees are amazing, explore its flora and fauna, some of which are used by locals to cure diseases. You can book this excursion through your cruise or local tour operators like David of Poinciana travels. Cruisers who have taken this excursion with him, rave about his customer service and knowledge of the destination. 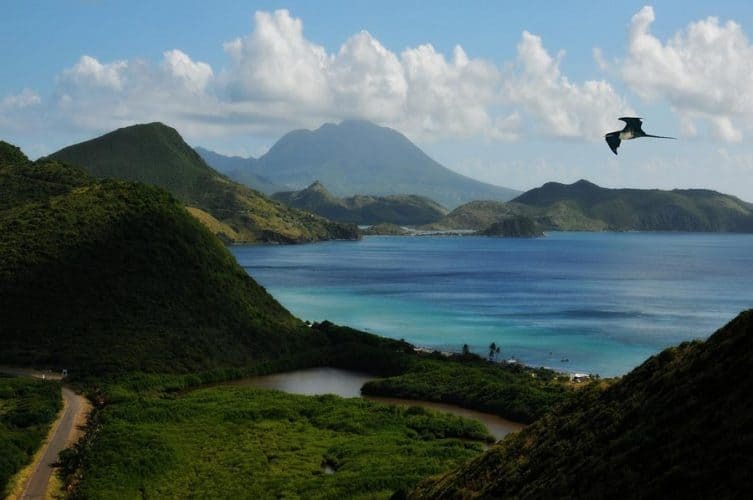 Hiking is an exhilarating yet thrilling experience to try in St Kitts. Standing at 3,792-foot tall, Mount Liamuiga is located on the Northwest side of the island. It’s one of the tallest peaks in the archipelago. Visit the now extinct volcanic mountain for a fun day in nature and for the stunning views at the top. The south end of the island where the ships dock offers some of the best beaches in St. Kitts. The beaches promise nothing short of laid-back soothing skies with picturesque jewel blue shores. The waters whisper a breeze of sweet aroma that is formed from the dashing waves. Another exotic beach would be Cockleshell Beach. It’s arguably the best beach in St Kitts due to its powdery white sandy beach. The locals love partying on this beach during public holidays and weekends. The Tranquility at Sandbank Bay is out of this world. It’s lovely to gaze upon and some years back, the beach was completely untouched by human hands. But now everyone can enjoy and splash in its waters. Sunscreen is expensive on the ship, get from here before your cruise vacation. Some other ideal beaches include South Friars, Frigate Bay South, Frigate Bay North, Turtle Beach, Pinney’s beach Nevis, Banana Bay, among others. South Friars and Frigate Bay South are the most easily accessible beaches from Basseterre and more popular with Cruise visitors. They can get a little crowded, but luckily Cockleshell beach is always a cab ride away. Enjoy the festivities at Independence Square. This public square acts as a central hub for the cultural life of the Kittitian people, it was constructed in the late 1700s and was used for slave auctions and council meetings. In 1983 however, the square was christened in celebration and as a show of respect to the independence of the Federation of St. Kitts. Today it’s a space mostly used by locals and tourists alike for family gatherings, outings, parades, festivals, parties and many more. St. Kitts is full of rich and diverse history about its colonialism. The locals are friendly and very quick to greet each other. Engage and mingle with a few for some deep learning of the Caribbean cruise island. Chatting away with the locals while enjoying a cold lime drink is a favorite past time of this friendly people, join in and learn something about the island. It’s what they call “limin”. Explore the history of the island’s sugar manufacturing years in one of its most iconic plantation houses. Wingfield Estate is an old sugar estate that was founded in the early 16th century. While approaching the Wing field estate, you will notice the stone chimneys, an aqueduct, and windmills that once stood strong and powerful. The ruins, found at the estate, are an indication and a reminder of how thriving the sugar industry was in those early years for St Kitts. Learn the history behind the structures in the estate and enjoy picturesque views of the lush backdrop. Earls of Romney owned this mansion which dates all the way back to the 1600s. Set in approximately 8 acres, the Romney Manor has enjoyed only five family owners to date. In 1625 the property was purchased by the great, great, great grandfather of Thomas Jefferson (third president of the U.S.A). It’s surrounded by botanical gardens, lovely lawns, shrubs, and rich history of many centuries ago. It’s currently used by the artists who create beautiful Caribelle Batik. You can visit the manor and see how the batik is made and also purchase some of the products as souvenirs. Eccentric poaches, and balconies are what meets the eye at the Fairview Great House. This house was owned by a wealthy plantation owner in the 18th century. Apart from a dining room with antique silver, the house has hosted a guest from the royal family. Prince Charles stayed at the home when the house was a hotel. It’s an all rounded trip, walk in the footsteps of a royal and learn how to taste and cook rum. St. Kitts is boarded by the Caribbean Sea to its west, and Atlantic sea to it’s east. The calm waters of the Caribbean Sea are perfect for swimming and snorkeling while the wavy waters of the Atlantic are perfect for surfing. Don’t forget your essential water shoes from Amazon right here. All in all, with a combination of these two bodies of water, the island features all the popular water sports. You can try snorkeling, diving shipwrecks, kayaking, paddle boarding, parasailing, and boat rides. The catamaran ride that takes you to the sister island of Nevis is not to be missed. Book an excursion to the island for a fun day exploring the coastline of the two islands and its attractive features. Peddle through the small villages and old historical sites as you enjoy the scenery. Sports shoes are a must when enjoying the views from a bicycle, get yours here. Groups are formed for this activity to make it more fun and enjoyable, as well as taking breaks along the way. Hit the small town, tour sugar plantations and stop for a snack break along the way. In the middle of the circus of Basseterre stands the Berkeley Memorial, a monumental green structure that honors Thomas Berkeley, a president of the General Council in the 1880s. The structure features a fountain and a clock facing four different directions within the four streets leading to the circus center. The walking tour towards this monumental structure will also lead you to view the National Museum, courthouse and the town’s churches. Ride through the sugar cane fields and into the tropical forest. Enjoy the view from the back of a horse. St. Kitts has some of the finest horseback rides so take the chance and tour the forests for a thrilling adventure. The towering peak gives you a clear glimpse of the surrounding villages, beautiful oceanic view and an unforgettable experience. You might need a sun hat or visor for your horseback ride. Apart from horses, this town has been known to host major cricket events, so much so that at one point the world cup was held in the island. Most high-level games can be watched at Warner Park. Mid-June hosts the one-day international games. If you are there during this time, you might want to visit the park. You will enjoy the matches together with the eclectic crowds and enjoy a true Kittian experience. Depending on your taste buds, you are bound to enjoy the finest foods and drinks of St. Kitts. The food is tasty, fresh and mixed with the right ingredients. Make a point of enjoying the local favorites such as jerk chicken, candied sweet potatoes’, huge lobsters, suckling pig among others. The ATV ride is a thrill in itself, pick up a helmet, hop on the ride, turn on the engine and explore St. Kitts hidden treasures. Make sure you have all your travel gear for these type adventures from Amazon. If you are down for some flying adventures, take up the zip line experience. St. Kitts boasts of one of the longest zip lines in the Caribbean. Get strapped in the 1350 foot long course and shoot through the air up above the canopy of the lush green rainforest. This island is also a bird watchers paradise. St. Kits boasts of over 200 kinds of bird species. The islands ecosystems draw these birds to its rainforest, salt ponds, and lakes. Some of the beautiful species include frigate bird, grey kingbird, red-tailed hawk, and brown pelican. Between the months of April and June, is the best time to get a view of a group of rare turtles who show up from the islands Atlantic coast to lay some eggs. If in the mood for some peace, good food, and the serene environment without the disturbances of the surrounding bustle, Palm Court Gardens and Restaurant is the place to be. The restaurant might be pricey, but it’s worth the treat. The infinity pool is an attraction by itself, and lunches and breakfast are served daily while dinners are served on Fridays and Saturdays alone. The botanical gardens are also a sight to behold. The weather in St Kitts is mostly hot and humid all year round, making it favorable for visits. May and June are winter months and see far fewer crowds. Peak seasons are from December to April where you get to experience St Kitt’s carnivals. Therefore, plan your visit according to the months that suite your purpose. Being up and down having fun is amazing, but don’t forget to take an hour or two just to relax and take in the beauty of the place. If you are looking for a more relaxing experience, you can also try one of St. Kitts’s spas, some shopping therapy will also do you good. Now that you are armed with a handful of fun things to do in St. Kitts start planning and booking early. See you there. Happy Cruising! !